In this article, I would like to suggest for beginners how to learn Spring framework to develop Enterprise Java EE applications. Spring is an Open Source framework, developed by Rod Johnson. 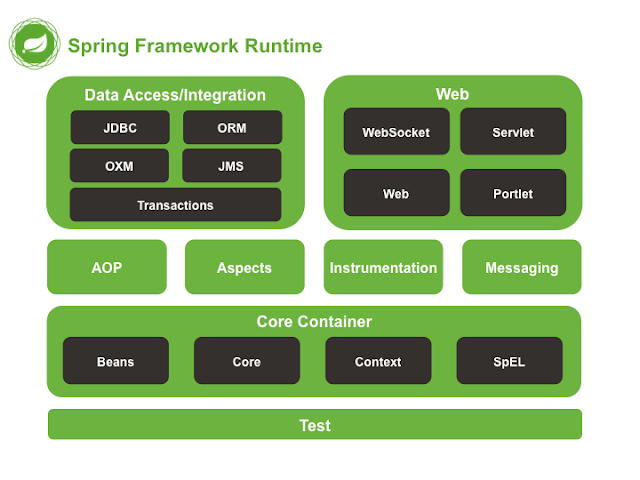 Read the complete overview of Spring framework at Spring Framework Overview. Spring framework is open source and hosted all its code base on GitHub so you should check out at GitHub repository of Spring framework. My suggestion is along with the Spring framework, you should also learn Spring Boot. Spring Boot is a project built on the top of the Spring framework. It provides a simpler and faster way to set up, configure, and run both simple and web-based applications. Check out most popular Spring boot tutorial here at Spring boot tutorial. These courses are available on Udemy with very less cost so you can check out once. I always prefer to purchase a Udemy course because the courses are very worthy and the cost is very less (around 10$). Know more details about spring framework online course at Top Spring Framework Online Courses. I highly suggest you go through my all Spring framework related tutorials which will give you real-time experience. I have used the latest release of Spring framework and JDK 8 or later versions in all the examples. Building a RESTful Web Service - Learn how to create a RESTful web service with Spring. Scheduling Tasks - Learn how to schedule tasks with Spring. Consuming a RESTful Web Service - Learn how to retrieve web page data with Spring's RestTemplate. Building Java Projects with Gradle - Learn how to build a Java project with Gradle. Building Java Projects with Maven - Learn how to build a Java project with Maven. Accessing Relational Data using JDBC with Spring - Learn how to access relational data with Spring. Uploading Files - Learn how to build a Spring application that accepts multi-part file uploads. Authenticating a User with LDAP - Learn how to secure an application with LDAP. Messaging with Redis - Learn how to use Redis as a message broker. Messaging with RabbitMQ - Learn how to create a simple publish-and-subscribe application with Spring and RabbitMQ. Accessing Data with Neo4j - Learn how to persist objects and relationships in Neo4j's NoSQL data store. Validating Form Input - Learn how to perform form validation with Spring. Building a RESTful Web Service with Spring Boot Actuator - Learn how to create a RESTful Web service with Spring Boot Actuator. Messaging with JMS - Learn how to publish and subscribe to messages using a JMS broker. Creating a Batch Service - Learn how to create a basic batch-driven solution. Securing a Web Application - Learn how to protect your web application with Spring Security. Building a Hypermedia-Driven RESTful Web Service - Learn how to create a hypermedia-driven RESTful Web service with Spring. Accessing Data in Pivotal GemFire - Learn how to build an application using Gemfire's data fabric. Integrating Data - Learn how to build an application that uses Spring Integration to fetch data, process it, and write it to a file. Caching Data with Pivotal GemFire - Learn how to cache data in GemFire. Managing Transactions - Learn how to wrap key parts of the code with transactions. Accessing Data with JPA - Learn how to work with JPA data persistence using Spring Data JPA. Accessing Data with MongoDB - Learn how to persist data in MongoDB. Serving Web Content with Spring MVC - Learn how to create a web page with Spring MVC and Thymeleaf. Converting a Spring Boot JAR Application to a WAR - Learn how to convert your Spring Boot JAR-based application to a WAR file. Creating Asynchronous Methods - Learn how to create asynchronous service methods. Handling Form Submission - Learn how to create and submit a web form with Spring. Building an Application with Spring Boot - Learn how to build an application with minimal configuration. Working a Getting Started guide with STS - Learn how to import a Getting Started guide with Spring Tool Suite (STS). Consuming a RESTful Web Service with AngularJS - Learn how to retrieve web page data with AngularJS. Consuming a RESTful Web Service with rest.js - Learn how to retrieve web page data with rest.js. Consuming a RESTful Web Service with jQuery - Learn how to retrieve web page data with jQuery. Enabling Cross-Origin Requests for a RESTful Web Service - Learn how to create a RESTful web service with Spring that supports Cross-Origin Resource Sharing (CORS). Accessing JPA Data with REST - Learn how to work with RESTful, hypermedia-based data persistence using Spring Data REST. Accessing Neo4j Data with REST - Learn how to work with RESTful, hypermedia-based data persistence using Spring Data REST. Accessing MongoDB Data with REST - Learn how to work with RESTful, hypermedia-based data persistence using Spring Data REST. Accessing Data in Pivotal GemFire with REST - Learn how to work with RESTful, hypermedia-based data persistence using Spring Data REST. Producing a SOAP web service - Learn how to create a SOAP-based web service with Spring. Working a Getting Started guide with IntelliJ IDEA - Learn how to work a Getting Started guide with IntelliJ IDEA. Testing the Web Layer - Learn how to test Spring Boot applications and MVC controllers. Accessing data with MySQL - Learn how to set up and manage user accounts on MySQL and how to configure Spring Boot to connect to it at runtime. Building a Reactive RESTful Web Service - Learn how to create a RESTful web service with Reactive Spring. Deploying a Spring Boot app to Azure - Learn how to deploy a Spring Boot app to Azure. Spring Security and Angular - A tutorial on how to use Spring Security with a single page application with various backend architectures, ranging from a simple single server to an API gateway with OAuth2 authentication. Once you will familiar with Spring framework and Spring Boot then you can go through these free open source projects and have good hands-on experience. If you need any help then connect with me on Twitter, Facebook, LinkedIn, GitHub.